Hi everyone, hope you all had a great week! I changed up the format a bit, as always any feedback is appreciated. For this post, I wanted to talk a bit about cilantro. This is a tender herb similar to basil and mint which means they have delicate leaves and are best when used raw, as a garnish or added at the end of the cooking cycle. 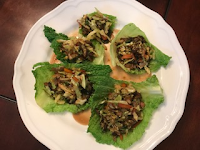 This is a great addition to many dishes and the best part is you get all that flavor and it only has 1 calorie for a 1/4 cup. Another couple of interesting facts are that this herb provides 5% of the daily requirement of Vitamin A and 2% of the daily requirement of Vitamin C. Cilantro is a spice that I can not get enough of but it wasn't always that way. The first time I ever experienced this flavor was at a Thai restaurant. It was in a pinkish colored soup that reminded me of dish soap every time I took a spoonful. I later found out it was common for a lot of people to think cilantro had a soapy taste, apparently there is a scientific reason behind that which I won't get into. However, there may have just been some soap residue in that bowl of soup. I am not sure what transpired to shift my palate but now I find it to be one of my go to ingredients. I use it in soups, salads, dressings and of course Asian, Thai, Indian and Mexican inspired dishes. I have noticed that people love it or hate it and there is no in between. So if you love cilantro, these are the recipes for you! I chopped it added a 1/4 cup of olive oil to my food processor and blended it I then added an additional cup of olive oil with sea salt and pepper to taste. Very simple but a great base for other things. This created an infused oil which I use in cooking and salad dressings. 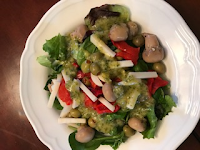 After using some to make the following recipe, I mixed the remaining oil with lemon, white balsamic vinegar and some honey to make an amazing salad dressing! A great way to make use of something that would have typically been discarded. I didn't include measurements for the salad dressing since I feel this is totally up to individual tastes and based on the amount you had left over. So do what I do and add a bit at a time and just keep tasting it until it is perfect for your palate. As I am working around my kitchen preparing my dish for you, my dog Bella is by my side and is my cooking companion. She is always available to taste any recipe that I am working on. Last week I mentioned I would tell you Bella's story. Bella was a rescue from North Shore Animal League. We don't know a lot of her background but we do know that she was brought from somewhere in Tennessee and was born with a deformed front paw causing her to walk on three legs. According to her paperwork she is 4 years old. One of my good friends volunteers at the shelter every week and saw this unfortunate girl and sent me a text and her picture. My phone didn't have service so I could not open the picture but I happened to be in the vicinity which I never am so I decided just to stop by. That choice changed both Bella's and my life. I saw her in the cage and watched as everyone stopped by to look at her but when she stood up and they noticed her deformed leg they just walked away. This was when I decided she was coming home with me. As soon as they took her out of the cage, her life was changed forever and so was mine! Now unto the Asian Inspired Wraps. I had some savoy cabbage in the refrigerator, I usually buy white cabbage but wanted to experiment a bit. 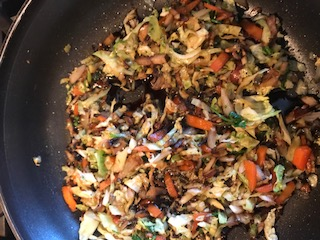 I had used half the head in some traditional coleslaw but wanted to try some other things with the remaining cabbage. I pulled off some of the leaves to use as my outer wrap and I chopped up the remaining cabbage, carrots, mushroom, a couple of sprigs of cilantro, some fresh ginger and sauteed it in the cilantro infused oil. I then steamed the leaves until tender. 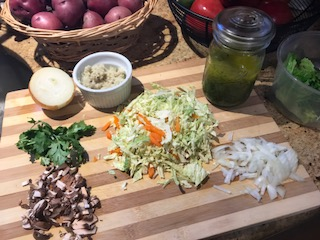 If you didn't save any of the cabbage leaves, you can always use ice berg or romaine lettuce for your wrap. I encourage you to experiment with what you love and you will love what you make. The worst thing that can happen is you will make something you don't like and then you don't make it again! Would love to hear your variations on this dish, please feel free to share your thoughts and comments.